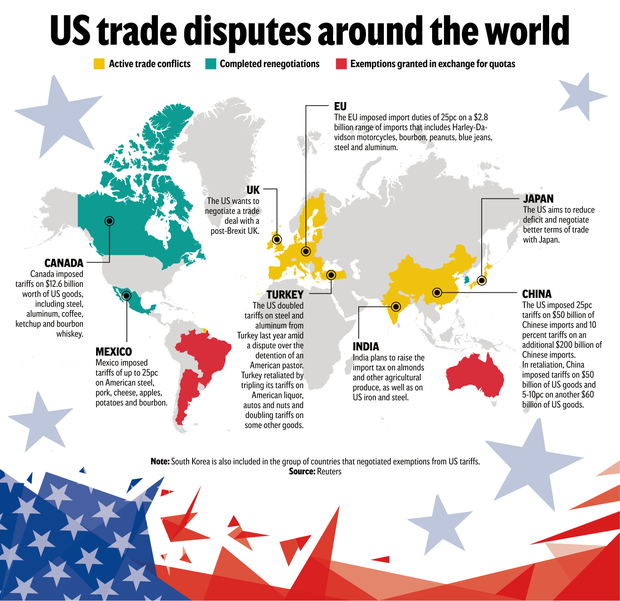 US President Donald Trump's blunt-force use of tariffs in pursuing his 'America First' trade agenda has angered many, from company executives to allied governments and members of both parties of Congress. As US-China talks to end a trade war reach their endgame, politicians, executives and foreign diplomats are urging Mr Trump and his team to hold out for meaningful structural reforms in China to address entrenched problems in the relationship that hurt US and other foreign companies and workers. Mr Trump's trade war "has let the genie out of the bottle" by lifting expectations that the trade war will force China to reform policies that businesses and foreign governments regard as unfair, said Steven Gardon, vice-president of indirect taxes and customs at Lear. Mr Gardon's firm is an automotive seating and electrical supplier with plants in 39 countries, including the United States and China. "Now that all these issues have been raised, there's a lot more domestic political support to address these issues, and I don't think you can pull back from that," Mr Gardon said at a Georgetown Law School forum this month. Mr Gardon's comments reflect a broad shift in US and international business sentiment towards China's economic and trade policies, one that is aligned with Trump's goals, if not his tactics. Mr Trump's trade team say they are in the final stages of negotiating what would be the biggest economic policy agreement with China in decades. US Trade Representative Robert Lighthizer and Treasury Secretary Steven Mnuchin head to Beijing this week to try to accelerate talks with Chinese vice-premier Liu He, who is set to travel to Washington for more negotiations in early April. China's President Xi Jinping is seen as reluctant to make economic reforms under US pressure, and Mr Trump has said he may keep tariffs on Chinese goods for "a substantial period" even if a deal is struck. He may find it easier to live with the tariffs Mr Trump has imposed on trade than to change China's model for economic development. While big Chinese purchases might be tempting, they would do nothing to address what US firms competing in China or against Chinese firms say are structural problems with a system stacked against them.